Starting in 2010, Greece received two bailouts, totaling €240 billion, from the ‘troika’ of the European Central Bank, the European Commission and the International Monetary Fund. Even assuming Greece continues the harsh austerity measures that its government has enacted since 2010, the next government will still need to find €12 billion in financing from the troika for 2015 and 2016, which wants to impose additional budgetary conditions, including wage cuts for some public employees. Tspiras and SYRIZA have moderated their positions since 2012, but they still hope to reverse some of the austerity measures that the current government imposed, including an effort to privatize certain public-sector companies. Whereas the current government hopes to achieve primary budget surpluses of between 3% and 5% in the next two years, Tsipras merely wants Greece to balance its budget. SYRIZA currently hopes that the European Union will write off half of the country’s €320 billion in debt and otherwise extend the repayment program of the rest of its debt for up to 60 years. Insofar as he realizes that Greek public debt load is unsustainable, Tsipras’s position is not so unrealistic for a country whose GDP in 2013 was around €198 billion. It’s easy to imagine that by forcing Europe’s hand, Tspiras could indeed win at least some form of bond haircut — the costs to Europe are relatively low to the uncertainty that would follow a new Greek financial crisis or its exit from the eurozone, which could snowball into a full-fledged eurozone financial crisis. With Greece headed toward tough negotiations with EU and troika leaders in any outcome, voters might well be tempted to give Tsipras a shot at winning a better deal than Samaras or his predecessors have. 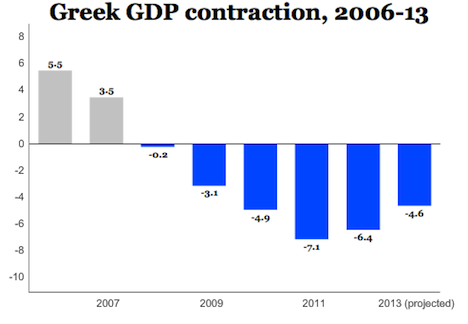 But Tspiras has been wrong before about extracting concessions from Europe — he cockily (and wrongly) predicted in 2013 that Greece would receive a bond haircut after the German federal elections. German chancellor Angela Merkel, in particular, is loathe to make any concessions to Tsipras, worrying that it would set a bad precedent for future member-states. Moreover, if Tsipras cancels Greece’s privatization program and increases social welfare spending, he’ll quickly find that he needs to raise much more than €12 billion for his first two years in office. That could force Tsipras to continue much of the prior government’s austerity measures, which could splinter SYRIZA. The key figure in any Tsipras-led government negotiations with Europe will be George Stathakis, a leftist economist who is as measured and restrained in his rhetoric as Tsipras is fiery and impassioned. Stathakis recently met with London’s top bankers in a trip last month to the United Kingdom, and if SYRIZA wins elections, expect to see a lot of Stathakis in the days following the vote — if for no other reason than to prevent capital flight from a spooked business class. If he wins the January 25 polls, however, Tsipras will instantly become the leader of the anti-austerity movement across Europe, emboldening similar movements, such as Spain’s newly formed Podemos. It would make centrist leftists like Italian prime minister Matteo Renzi and French president François Hollande seem more moderate in their calls for pro-growth EU policies, and a Tsipras win might especially embolden Renzi, who boasts more domestic popularity than just about any EU leader today. Accordingly, just as in 2012, expect to see key figures within the European Union indicate their support for Samaras (though not always in obvious ways). Merkel, European Commission president Jean-Claude Juncker, European Council president Donald Tusk and even British prime minister David Cameron will all be rooting for a Samaras victory, and may find subtle ways to influence the election. Polls currently show that the hard-right, paramilitary Golden Dawn (Χρυσή Αυγή) will likely remain the third-largest party in the parliament, notwithstanding the government’s 2013 crackdown on many of Golden Dawn’s leaders for inciting lethal violence. With an unapologetically militant anti-Roma, anti-immigrant and anti-Europe platform, Golden Dawn won 9.4% of the vote in May’s European parliamentary elections. If it repeats that result in January, it could potentially double the number of seats it holds in the Greek parliament. No party, on either the center-right or center-left, is willing to align itself with Golden Dawn, so its success increases the chances of a hung parliament. That could mean a repeat of the 2012 scenario, when the May 2012 elections were so inconclusive that no one could form a government coalition, leading to the follow-up June 2012 elections. That would have the effect of prolonging even longer the EU post-bailout negotiations and add even more uncertainty to the Greek political drama. SYRIZA has been able to consolidate so much support among Greek leftists because it’s become the clearest brand for anti-austerity politics. That’s due, in no small part, to the splintering of the traditional Greek center-left over supporting the terms of the bailout. Under its leader, former finance minister Evangelos Venizelos, PASOK (Panhellenic Socialist Movement – Πανελλήνιο Σοσιαλιστικό Κίνημα) has served as a genuinely loyal ally in Samaras’s coalition government, despite the party’s near-collapse as a force in Greek politics. As elections approach, its former leader, prime minister George Papandreou, has openly contemplated forming a new party, despite the fact that it was his father Andreas formed PASOK in 1974. A high-level PASOK split might prove fatal to Venizelos, depriving Samaras of a key partner in any future coalition. 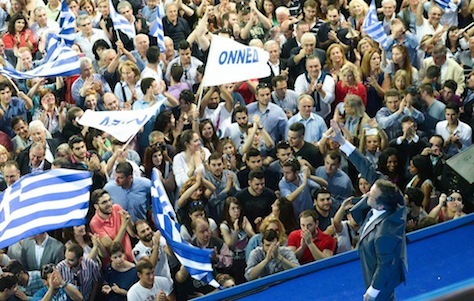 To Potami (Το Ποτάμι), a high-minded centrist party formed in 2014 by television journalist Stavros Theodorakis, has at times shown potential of breaking out to attract wide support among the Greek electorate, but it fell far short of hopes in European elections in May. Meanwhile, two small parties, the Independent Greeks (ANEL, Ανεξάρτητοι Έλληνες), an anti-austerity spinoff from New Democracy, and the Democratic Left (DIMAR, Δημοκρατική Αριστερά), a more moderate spinoff from SYRIZA, are in danger of falling short of the 3% parliamentary threshold altogether. After the June 2012 elections, the Democratic Left warily joined New Democracy and PASOK in government, but it left the coalition in June 2013 over the harsh nature of budget cuts. Its leader Fotis Kouvelis, once one of Greece’s most popular politicians, has indicated he would support a SYRIZA-led coalition. Good job on short notice, Kevin! You didn’t have time to look up the revised GDP figures, though. 2012 was down 6.6%, 2013 down just 4%. It seems likely the effect on the euro zone of a SYRIZA victory would be less than if something similar had happened a couple of years ago, right? Greek sovereign debt is owned overwhelmingly by institutions like the ECB that have no interest in running away. But the counterpart of that, I guess, is that the ECB is an even more formidable negotiating adversary.